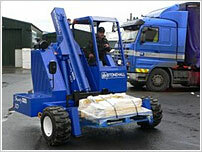 The truck mounted forklift concept has been around since the 1970's. Up until the mid 1980’s, this type of forklift was used primarily in the turf and sod industry. 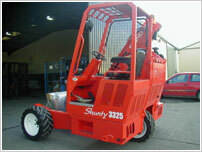 As these forklifts began to gain greater acceptance in this industry, they also gained widespread visibility. It soon became apparent that the truck mounted forklift was indeed a versatile machine which could be adapted for use in other industries. The adage “time is money” is very appropriate in today's competitive markets. This is especially true within the various bulk goods delivery sectors. Increased truck productivity, faster vehicle turnaround time, improved delivery scheduling, and increased customer satisfaction - factors which lead towards increased profitability - are all attainable when you use the Stonehall Shunty Truck Mounted Telescopic Forklift. you need The Shunty Advantage. a range of attachments can be fitted to handle cable drums, poles, etc. Not all truck mounted forklifts should be considered equal. The Stonehall Shunty truck mounted forklift with its patented telescopic boom configuration is more versatile and provides more capability than conventional masted truck-mounted forklifts. 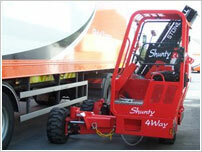 Plain and simply, if you want productivity on the job everyday, the Stonehall Shunty is The Smarter Choice. 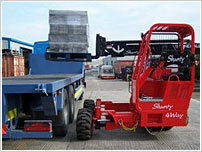 The ability to reach across a trailer to load or pick up a pallet; the full free lift capability or the superior operator visibility when handling a load are but a few of the standard features that distinguish the Stonehall Shunty from the rest. The Stonehall Shunty is truly a versatile machine. With single and all wheel drive models available and carrying capacities 3000 kg (6600 lb), there is a Shunty to suit your specific needs. Increase your productivity and profitability today — Make that move with the Shunty.